The hit probability of any shoulder-mounted, selective-fire weapon can be greatly increased by installation of a vertical foregrip, as weapons of this type are often deployed in the full auto mode, especially at distances under 15 yards. In addition, flashlights attached to shoulder-mounted weaponry are a requirement for urban warfare. Without doubt, an illumination device is a very important accessory. Until now, attempting to use a tactical flashlight in conjunction with a vertical foregrip resulted in three scenarios: 1. Purchase an expensive combination vertical foregrip/flashlight. 2. While trying to maintain a grip on the vertical foregrip, attempt an uncomfortable and dangerous rotation of the grip hand to try to get the thumb high enough to engage the rear of the flashlight typically mounted at the three o'clock or nine o'clock position (strong left shooter). 3. Use an expensive and somewhat messy pig tail with a pressure pad glued to the foregrip. GG&G’s staff has solved the problem of interfacing a vertical foregrip with a weapon-mounted flashlight in an ingenious manner. The Offset Tactical Flashlight Mount For Use With Vertical Foregrips places the M3 or other tactical flashlight, offset to the right or left of the weapon’s forearm at about 5 o’clock or 8 o’clock, respectively. This permits the operator to manipulate with the thumb, the M3 Illuminator’s rocker switch or rear pressure button of other tactical flashlights such as many within the Surefire line, while the support hand remains solidly on the vertical foregrip. The Offset Tactical Flashlight Mount For Use With Vertical Foregrips comes complete with both rails. The M3 mounting rail can be easily removed and a short section of MIL-STD-1913 rail installed for attaching a SUREFIRE or other small flashlight by means of a standard ring. The mounting rails are fully interchangeable. The new GG&G Offset Tactical Flashlight Mount For Use With Vertical Foregrips can be mounted on the GG&G UFIR, Knight’s Armament RIS or RAS systems, C-More rail system and other integrated rail systems. This ambidextrous mount is attached by means of a squeeze rail. Manufactured from aircraft grade 6061 aluminum alloy, it has been hard-coat anodized per mil-SPEC in a matte black combat finish. The offset tactical flashlight mounts from GG&G are made in the USA at their Tucson, AZ factory. When purchasing any part that mounts on to your gun you want to make sure it fits perfectly as per mil-spec standards, and it isn't going to rattle or move later on. On an AR-15, M16, or M4, stealth and surprise are essential, and accuracy is paramount. 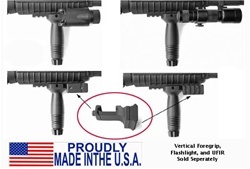 Every AR 15 flashlight mount from GG&G is made from top grade materials because it may be used in the field by military and police units who can't compromise the tactical advantage that comes with the right equipment.